WhenToHelp provides (at no extra cost) the use of your own organization Bulletin Board. Coordinators can post bulletins and have them remain posted for up to 1 year. You also can allow your helpers to post bulletins to the Bulletin Board. To stop helpers from posting bulletins, go to your SETTINGS>Global Helper Permissions page and change that option to No. 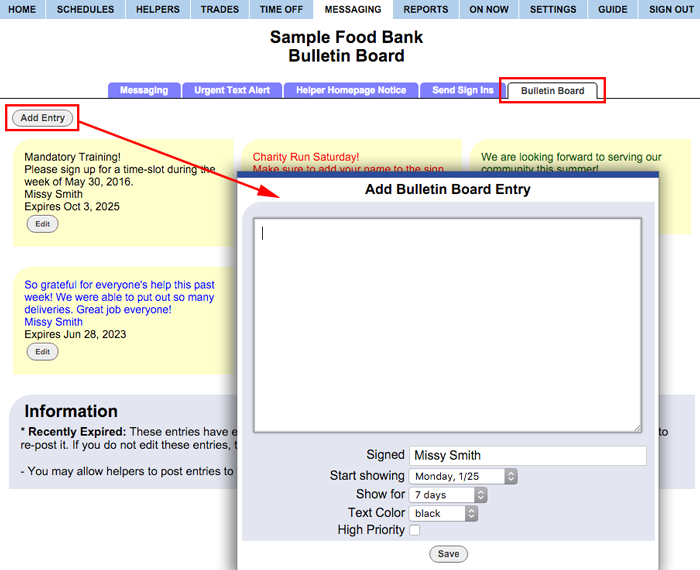 The Bulletin Board is viewable by coordinators and helpers and when any user signs in, they are notified in their "What's New" section if there are any bulletins on the board that they have not yet viewed. Each user can also set their My Notifications section to receive an email or text message when a new bulletin is posted. The Main Coordinator can also edit/delete any bulletin.